As mentioned in a previous post, I was working on making an iPhone/guitar interface with a bypass switch, not unlike the recently-announced iRig Stomp by IK Multimedia. I made something that worked, more or less, and wrote a page about it, and then found a lot of information online by others who have looked at the problem and interpreted it far better than I had (the page on this is now private til it’s better). My error was mainly in thinking this is a simple passive circuit with no components besides connectors and switches. It turns out that’s not true at all, that there is in fact a preamp and some passive filtering going on in the iRig and other phone/guitar interfaces. I didn’t think active circuitry would be present without a battery, but it turns out that the iPhone’s mic connection puts out 2.7 V in order to polarize condenser mic elements. 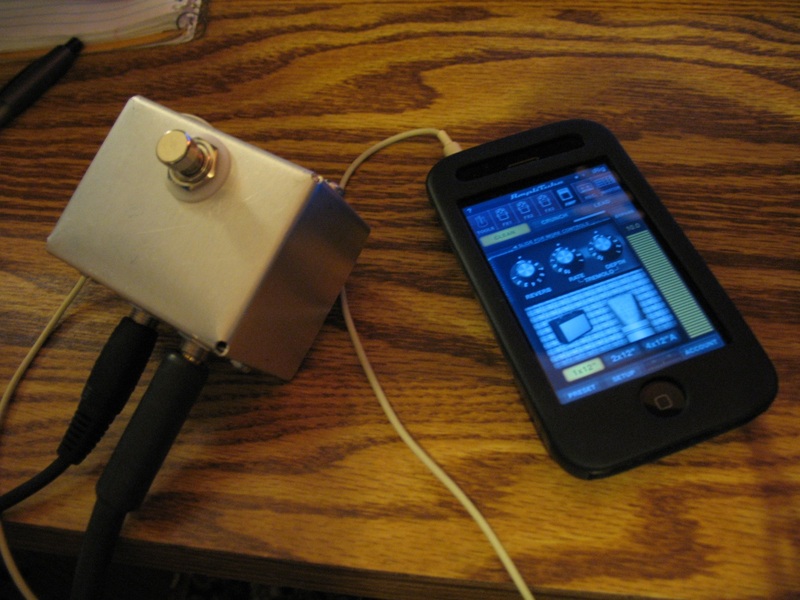 The iRig seems to use this to polarize a JFET in its preamp. So, long story short I need to spend more time on this. Here’s a thread I found recently I wish I’d seen earlier, it explains a lot. This entry was posted in Misc, Projects. Bookmark the permalink. hey. I do the same. see that. Fake iRig can be dangerous. Impedance mismatch can overheat the connector and in some case cause fire. Also, sub-standard headphone diode can reverse bias the voice coils in the headphone generating very large magnetic fields, Consider that these fields are only millimeters from your brain tissue I don’t think it is worth the risk to purchase a fake iRig. So much mumbo jumbo. If a MRI machine can’t fry your brain with its ultra-powerful magnetic fields, certainly a battery powered portable device won’t. the worst that can happen (and it’s bad enough) is poor sound quality or damage to the audio output on the ipod-iphone-ipad.